Charlestown, MA J.M. 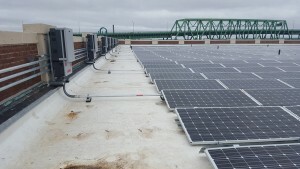 Electrical Company, Inc., premier professionals in advanced automated building system installations, and solar developer 621 Energy, have completed a 476 kilowatt (kW) solar photovoltaic (PV) energy system installation that will power the Massachusetts General Hospital research and parking facility located in Charlestown. The rooftop PV system was designed by 621 Energy and is expected to generate 568,000 kW hours in its first year of production. This project consists of 1,487 solar panels and 17 solar inverters that will help save the hospital approximately $95,000 annually. In addition to the solar system installation, 621 Energy and J.M. Electrical technicians mounted the solar PV system on the roof using a cutting edge racking system to account for high winds and building height. J.M. Electrical staff oversaw all day-to-day operations throughout the three-month project schedule to ensure that it was completed on time and on budget. J.M. Electrical has an on-going partnership with Massachusetts General Hospital and provides on-site building automation and electrical support to take care of any critical projects as they come up at the various healthcare facilities. J.M. Electrical has 30 years of experience and expertise in the installation of advanced automated building systems that have been the cornerstone of the business. Their experts will also continue to focus on retrofit/performance contracting, building automation controls, instrumentation, and fire alarm/integrated security systems. Founded in 1985, J.M. Electrical Co., Inc. specializes in the installation of integrated control systems, including automation controls, fire alarms and security systems, instrumentation, retrofits, and renewable energy. J.M. Electrical has developed a unique approach to quality management and customer satisfaction, assigning project managers to oversee installation, assist the customer through the planning and design processes, manage QA/QC and ensure that project milestones are met. J.M. Electrical successfully managed automation control work in the Boston Convention Center and Merck Pharmaceuticals’ Boston Research Center, among others. Headquartered in Lynnfield, Massachusetts and serving the greater New England region, J.M. Electrical carries ISO 9001 Certification, DCAM Prime Contractor Certification, NABCEP Solar PV Installer Certification, and LEED AP Accreditation, Building Design + Construction Certification. J.M. Electrical has over 140 employees, and all electricians receive over 10,000 hours of training throughout the NEC/IBEW joint training center. 621 Energy is a local, Massachusetts-based commercial-scale solar project developer known for technical excellence, personalized service and attention to detail. Founded in 2011, 621 Energy provides a complete range of solar PV solutions including project development, turnkey installation, financing, operation and maintenance, and solar and energy consulting services. Every project is optimized for the unique conditions of the site and customer. 621 Energy has partnered with investors, suppliers and contractors throughout Massachusetts and Connecticut to design, build, own and maintain all types of solar PV projects. 621 Energy provides systems for a fixed, turn-key price, or can provide investor-owned systems at no up-front cost through a Power Purchase Agreement (PPA).